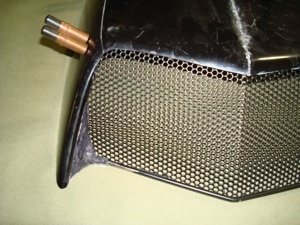 This custom air cleaner was made for a classic Ford Cougar but the general techniques will work on any antique, vintage or classic vehicle, in fiberglass and/or metal. 1. 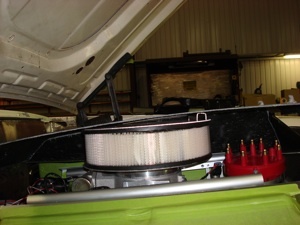 We start off by determining the minimum height needed above the throttle body, a minimum 2 inches is required for accuracy. 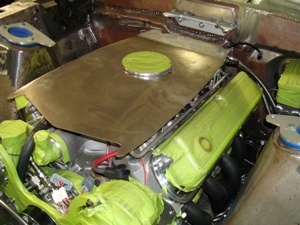 Taking our base to hood clearance into consideration we will use a 2.5 inch high flow air filter from K&N. 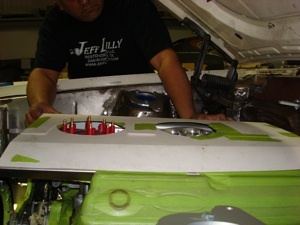 This will allow 1/2 inch between the bottom of the hood and the top of the new air cleaner. 2. We start with a paper mockup to check a few clearances. 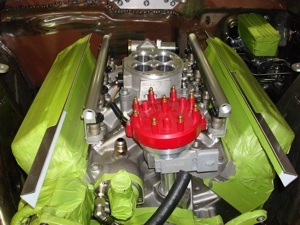 Notice the cut out for the distributor cap and wires. 3. 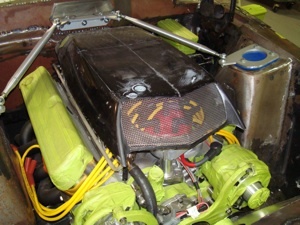 We purchased a reproduction fiberglass "Boss Mustang" hood scoop and laid it on the hood of our project car. Obviously it is way too large to use as is, so we will scale it down to fit and look the way we want. 4. 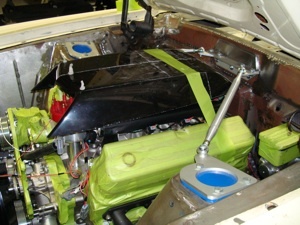 The mock up air filter is in place, notice the angle or pitch we have the mock up cover at. This will give us the look we believe to be best. 5. 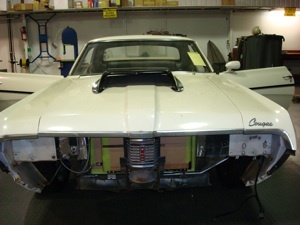 We cut up the hood scoop a bit to make it smaller. By down sizing it with the right cuts it will allow minimum body work later. 6. 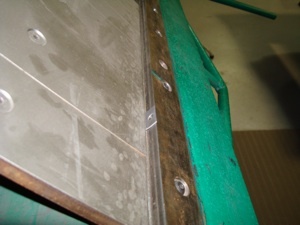 We sliced the unwanted sections out of it then crazy glued it together to keep it strong. 7. It is starting to take shape . 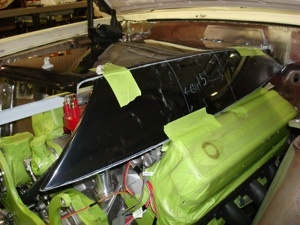 Notice the hershey kisses of window caulk used for checking hood to air cleaner clearance height. 8. We took some mesh and started to mock up a front screen to get the look we wanted. 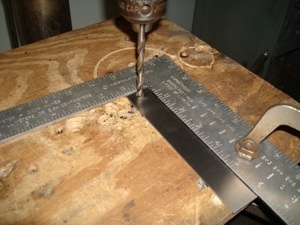 He then laid it on a piece of 18 gauge metal and traced out the perimeter to start working on the base. 9. Now we are ready to cut out the base. 10. 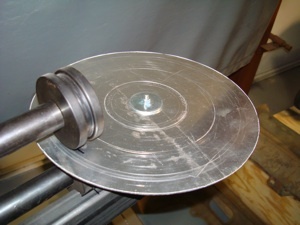 The side of the filter base is rolled out. This will keep it centered. 11. 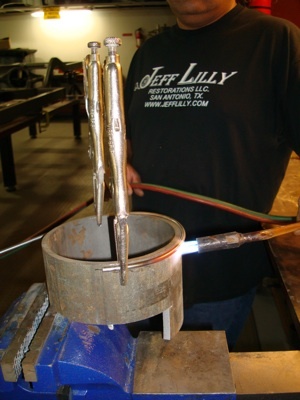 We spot weld the base ring in place at the angle determined in step #4. 12. 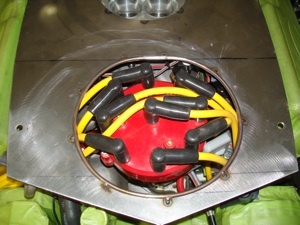 We have not cut out the distributor cap and wire hole yet because it is removed but that will be done shortly. 13. 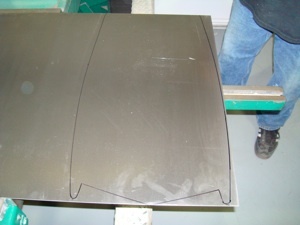 A few angle brackets to attach the fiberglass cover to the base are pre drilled before bending on the brake press. 14. A little bend and we can mount them to the air cleaner. 15. 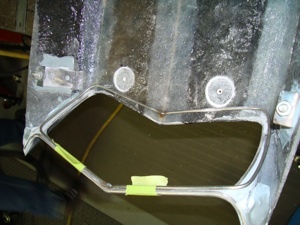 The brackets are long and need to be trimmed to fit. The rear ones are going to be a bit shorter to compensate for the taper in the cover. 16. We mounted a 1/4 20 bolt in each bracket to mount it to the base. 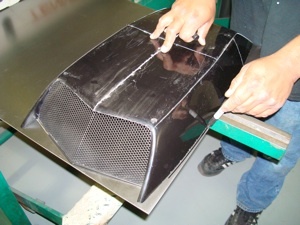 As seen we simply cleco´d the sides in to check fit. 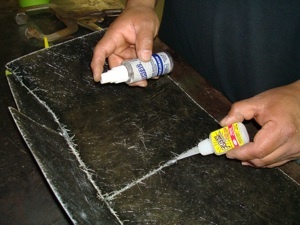 Once all is well we will adhere them with Vette panel adhesive. 17. We have them all mocked in place and now it is time to trial fit. 18. We have cut out the distributor cap and wire clearance and drilled the base for the cover bolts and are ready to check fit once we get a few other items made. 19. 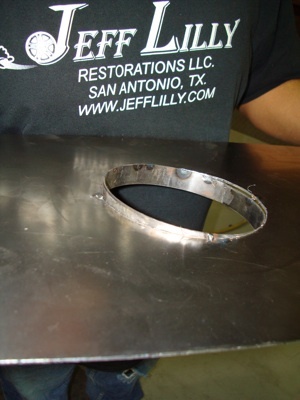 We had to fabricate an air filter top to hold town the base. 20. 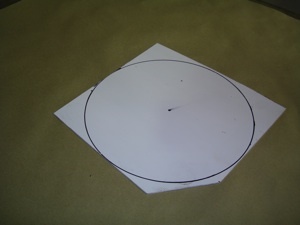 We drilled a hole in the center to roll it on the grinder for a perfect edge. 21. 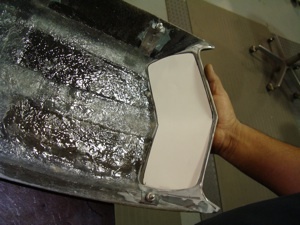 We will use the bead roller to recess the cover inside. 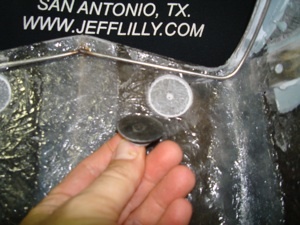 This will allow the nut on top of the air cleaner lid to stay below the custom fiberglass cover and not hit or interfere. 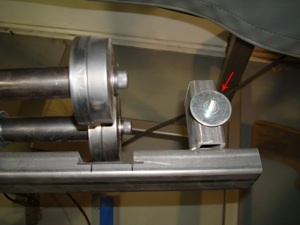 We fabricated a rotation stud with some tubing to keep it centered "See Red Arrow". 22. 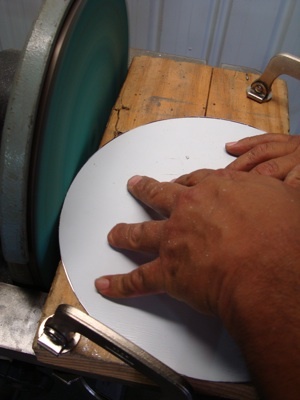 The bead roller at work. 23. 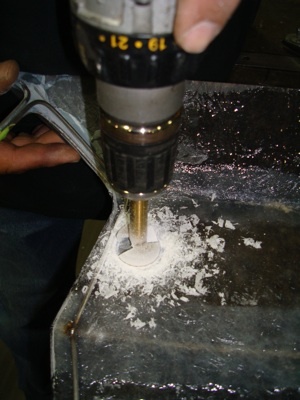 A rod needs to be formed to tack weld on the base at the distributor hole to eliminate rubbing on the spark plug wires. We bent it while heating against a piece of 6 inch round stock. 24. 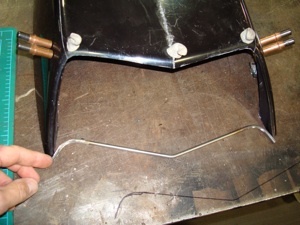 Here is the rod tacked in place. 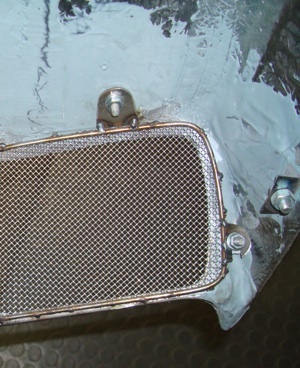 It will protect the spark plug wires from scuffs and stiffen the cover at the same time. 25. We decided to contour it a bit to allow a gradual step from the point of the cover to the mesh. This round hole mesh was only used for mock up as we are going to use a wire mesh screen laid out in a diamond shape as our final piece. 26. 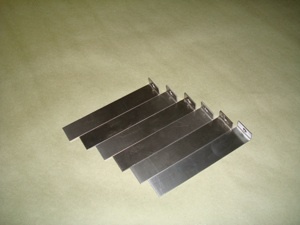 As seen here we fabricated a stainless wire to encase our gradual step. This will also stabilize the mesh once installed. 27. 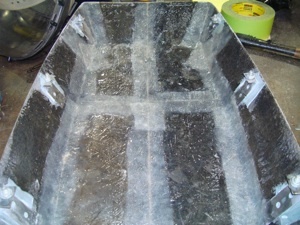 Here we fiberglass the lid on all the seams where we cut it during fabrication. 28. 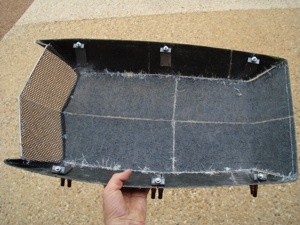 Using Vett panel adhesive we attached the wire support to the cover and are now paper mocking for our mesh cover. 29. 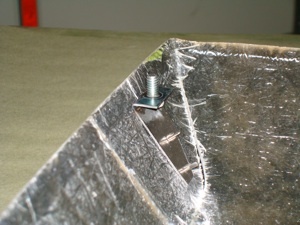 To make room for mounting screws of the mesh we counter sunk a hole in the fiberglass with a forister bit. 30. As seen the forester bit makes a nice recess to allow bolt head clearance. 31. 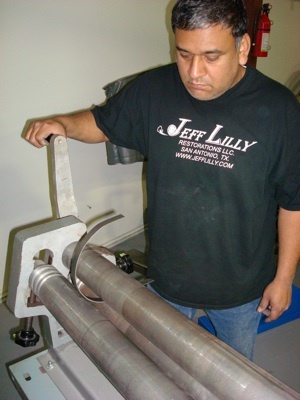 We chose "elevator" bolts with their large flat heads and will epoxy them in place. 32. 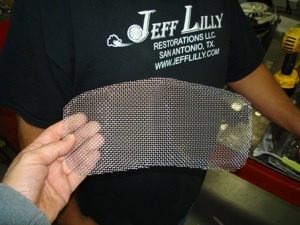 Here is our diamond patterned screen, bent to the desired shape. 33. And here we made a wire cage and tacked in a few mounting brackets to hold it in place. 34. And here it is mounted and ready for body work, paint and finishing out. 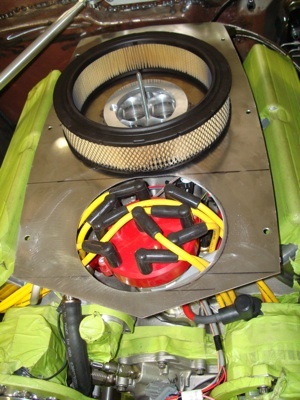 We will use a black distributor cap and grey wires to help hide those components.